Night Town is a sample proposal for a simulation game where you play a case worker for the recently deceased; think the world of Beetlejuice or Pixar's Coco; only one where YOU are helping each ghost find its home. 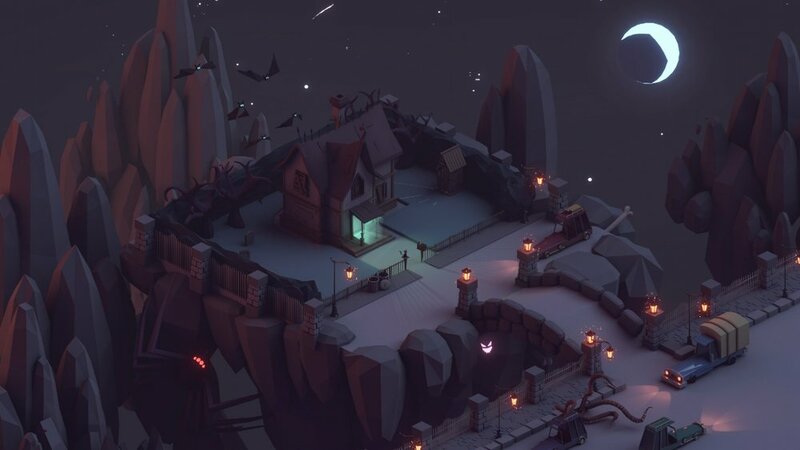 Primarily designed as a resource-management/settlement game as you welcome each ghost into a haunted house, Night Town also incorporates a campaign/story mode; where you send your spooks out into the real world to settle any unfinished business. Click here for full PDF, excerpt displayed below. From the players' view Night Town looks like a grid; new ghosts arrive in the centre of town at the Terminal. These new arrivals, called spooks here in Night-Town, are liPle more than Pac-Man ghosts when you pick them up, or friendly blobs like Kirby. They don't know why they're here yet, so that's why you give them a home-- All around the edge of the city are diﬀerent haunted house plots, that's where you're headed. When you're building a haunted house there are no limits -- each house is far bigger on the inside than it is on the outside. Players can grow and distort it how they like, and as it expands, build new rooms for spooks to wander around in. New additions can be made to both the interior and the yard (fancy a hangman's tree? How about a Pet Cemetery!) Spend some Mme in the lounge playing games, build up a library so they can read up on ghost stories of yesterday; or welcome some mariachi-ghouls in your music room. Spooks like living like they used to – they don't need to sleep and eat-- but they like to. This ain't no graveyard-- Night Town is a metaphysical metropolis. It's Mid- century Americana meets the Mexican Day of the Dead, a neon-noir where the sun never shines, ﬁlled with diners, cabs, and blocks upon blocks of bustling ghosts goin' bout their business. It's a place in-between, a candy- coloured underworld that some would call limbo. Ever been kicked out after last call, or at a train-station after hours? It's kind of like that. Simply put, Night Town is where people go when they die and have nowhere else to go. What's outside it? No one knows—the city is surrounded by a purple mist. Some ghosts that wander through arrive back in the middle of town. Others are devoured up by beasts unknown. Better not risk it. Besides, you got things to do. This place looks and sounds like a place you’d want to visit; ﬁlled with Mariachi music; Calypso beats; and crooning lounge singers. Special rooms in each haunted house are portals that take Spooks into the land of the living. Each is intrinsically 'scary'; think bedroom cupboards; mirrors; basements-- anywhere things go bump in the night. By using Will, players can port their ghosts to houses inhabited by living people. These are exploration missions; driven by discovery and scaring. Scaring is it's own game; travel from room to room; hide behind curtains and in cupboards. Low-level ghosts can knock books oﬀ shelves and ﬂicker light bulbs. Higher-level ghosts are able to do Beetlejuice level tricks: transforming rooms into fun-houses and possessing the living to make them dance the Mambo. Bigger scares take up your PsychoKineMc energy or PK for short (it’s like 'magic points’— you can ﬂy dishes round the kitchen all day; but 'IT'S SHOWTIME!' takes it out of you.) Once out of PK, you've got to get out of dodge, as your spirit evaporates back to big nothing. However every scare helps you build more WILL for next time. Of course it's not all carnival tricks-- to really move on your ghosts, they've got to ﬁnd out why they're there. Build up enough will, and you'll unlock campaign missions take you into each your spook's pasts. These take you through portals to their original home-- and solving their past means communicating with the living. Think of ghost stories from the movies: spirits are restless cause they're body was never found; their murderer got away with it; or a lost ring was never given to a family member. Your spooks can make friends with the household dwellers (think Lydia from Beetlejuice) who will help you in the real world, and solve the puzzle. But ﬁrst you'll need to gain their trust via a Ouija Board mini- game; spelling out message that win them over.